If you’ve heard of the Cineflex aerial camera system and are considering using it in your aerial filming project, chances are pretty good it was because of its high profile and successful use on the BBC nature documentary series Planet Earth (Please note this is an editorial reference, we did not work on Planet Earth). We do this stuff for a living and we thought the footage the team captured was pretty amazing too. We’ve long offered a Los Angeles Cineflex aerial camera package to our customers all over the world. We even shot the Los Angeles aerial unit work for the ITV-produced Billy Connolly’s Route 66. Aerial Filming Los Angeles – Cineflex Gimbal – side mounted aerial cinematography camera system. Contact us today for your Los Angeles aerial filming projects! We offer terrific prices and even better aerial video services! The Los Angeles based Cineflex system we offer is both very capable and an excellent value for many producers. The cost for the entire package is much lower for a typical Los Angeles-area aerial cinematography shoot than other systems in the market. That’s the good news. On the flip side, there are compromises when using this package in order to enjoy the lower prices. First off, take a good look at the photo above. This package comes along with the FAA-approved side mount. Now, the Cineflex can be mounted on either side, but as you can see, it does not look straight down nor can it “naturally” do the straight ahead to tilt down shots. We say naturally because it can be cheated in most cases yielding good results. 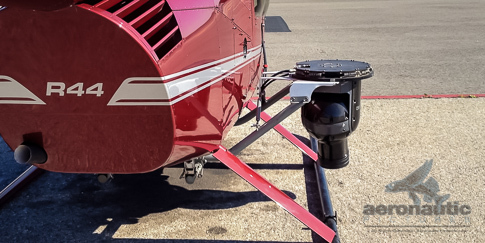 A system like the Gyron mounted on the nose mount of a helicopter can see straight ahead and tilt straight down naturally during aerial filming. Also illustrated in the Cineflex picture above is the dedicated helicopter offered with this Cineflex package. It is the Robinson R44, a very cost effective but small piston powered helicopter. There is room on the helicopter for the pilot, our Los Angeles aerial director of Photography, and up to one client. Larger jet powered helicopters often run as much as double the cost per hour as this little R44, but the larger ones can carry, in some circumstances, two clients or an aerial technician and a client in addition to the aerial DP and pilot. When planning your shot lists please keep in mind the R44 can fly no more than two (2) hours before needing to land and re-fuel. This Cineflex package also comes standard with the very good but not exactly UHD or state-of-the-art Sony HDC-1500 video camera. It delivers real HD and offers some good Sony cine-like gamma choices, but the Gyron comes standard with a RED Epic Dragon offering real 6K UHD aerial video.